These famous words spoken by Pontius Pilate, the judge at Jesus’ trial, mean “Behold the Man.” Pilate did not realize he was only half right. As you know from religion class, Jesus was a seamless blend of humanity and divinity. He could call upon his power as God to perform miracles like multiplying bread and fish to feed thousands of people, yet he cried when his friend Lazarus died, even though he knew he would soon raise him from the dead. He gave sight to a man born blind, yet he could not convince the religious leaders in Jerusalem to believe in him. In other words, in spite of Jesus’ divinity and his oneness with the Father, he still experienced the same human struggles we all do. This was most evident in the death that Jesus suffered. His pain was not lessened by his divinity. He spent a horrible night in a dank prison cell awaiting his death sentence. He was mocked, ridiculed, and spat upon on the Way of the Cross. 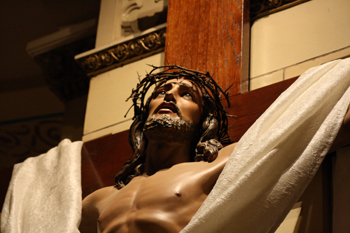 In his final moments, Jesus had trouble breathing due to the nails pinning him to the wood of the cross. He finally surrendered his last breath in total trust that his death would be the most glorious moment of his life, and that God’s plan would be fulfilled. What was this plan of God? It was simply that God wanted every person to know they were loved. In return, we express our love for God by loving one another. Jesus fulfilled God’s plan by his death. If Jesus did not experience death, then there would always be a separation between us and God. God would be “up there” someplace and we would be down here. But Jesus experienced everything that is human. His death and resurrection prepared the way for new life for all believers. After the trip, I wrote her a letter, expressing how I enjoyed meeting her and telling her that my mother liked the rosary beads. I did not hear back right away (this was before email, if you can believe it!). Some weeks later I received a return letter. It was not from Sister Mary, but from the superior of the convent. She wrote, “Sister Mary had a peaceful death. Shortly before she died, she asked for a cup of tea for the journey.” When I read this, I was saddened and glad at the same time. I was sad that she had departed this life, but I was extremely impressed by her faith and the peace it provided at the end of her life. Jesus’ death and resurrection changed everything. We now have the Holy Spirit to guide us so there is no longer any guessing about God’s plan for us. God has shared everything, including Jesus’ victory over death. In Jesus, God has shown us that death is a stepping stone to new life. So why do we continue to worry so much about death? In some ways, it is natural. Death, after all, was not part of God’s original plan. Death came about as a consequence of sin, as a result of the “devil’s envy.” There will always be a certain dark side to death. We will continue to wonder what is on the other side of the shadowy wall of death. There will still be concern, as the end nears, about whether we have done enough. Have we, for example, confessed all our sins or helped enough people in need or said enough prayers? While these may be good questions, we need not worry. Jesus has shattered the uncertainty surrounding death. The only thing necessary is trust. If we confidently place our lives in the care of God, then we, too, will glorify God with our death and be welcomed into God’s Kingdom forever. May God grace us with the same kind of faith Jesus had when our final days arrive. But, in the meantime, may our days be lived in union with God, who became a human person in Jesus, so that we may become like God.